Module-records blog about electronic music: Do you want a Minimoog ? I guess the answer is "Yes, of course". This little 3VCOs vintage synth is one of the best ever built and you hear his powerfull basses≤ads sounds in many electronic music production. So you can buy an used one : it's not easy and very expensive (2000 USD). You can also try the Minimoog voyager : The official reedition from Moog music with lot of goodies (midi, touch screen, memory) ; but keep in mind it's not a Minimoog but something else for 3000 USD. You can also buy a Studio-electronics SE-1 analog clone : It's sounds like a Moog as it's built with same circuitry and composants. 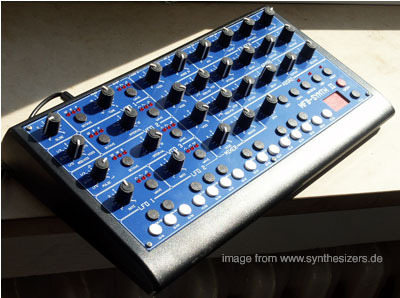 A cheapest but elegant solution is the MFB SynthII, an unassumed Minimoog clone from german Manufacturer : it sounds like a Moog thanks to its Moogish analog filter!!! And last but least all the virtual and inspirationless instruments (Gmedia Minimonsta, Arturia MinimoogV).